SQL Database 서버를 통해 관리되고 고유한 리소스 세트가 있는 단일 데이터베이스.As a single database with its own set of resources managed via a SQL Database server. 단일 데이터베이스는 SQL Server의 포함된 데이터베이스와 유사합니다.A single database is similar to a contained databases in SQL Server. 이 옵션은 새로운 클라우드 기반 애플리케이션의 최신 애플리케이션 개발에 맞게 최적화되어 있습니다.This option is optimized for modern application development of new cloud-born applications. SQL Database 서버를 통해 관리되는 공유 리소스 세트가 있는 데이터베이스 컬렉션인 탄력적 풀.An elastic pool, which is a collection of databases with a shared set of resources managed via a SQL Database server. 단일 데이터베이스를 탄력적 풀로 이동하거나 탄력적 풀에서 제거할 수 있습니다.Single databases can be moved into and out of an elastic pool. 이 옵션은 다중 테넌트 SaaS 애플리케이션을 사용하여 새로운 클라우드 기반 애플리케이션의 최신 애플리케이션 개발에 맞게 최적화되어 있습니다.This option is optimized for modern application development of new cloud-born applications using the multi-tenant SaaS application. 공유 리소스 세트가 있는 시스템 및 사용자 데이터베이스 컬렉션인 관리되는 인스턴스.Managed instance, which is a collection of system and user databases with a shared set of resources. 관리되는 인스턴스는 데이터베이스를 위한 공유 리소스와 추가적인 인스턴스 범위 기능을 제공하는 [Microsoft SQL Server 데이터베이스 엔진] 인스턴스와 비슷합니다.A managed instance is similar to an instance of the [Microsoft SQL Server database engine] offering shared resources for databases and additional instance-scoped features. 관리되는 인스턴스는 데이터베이스 변경 없이 또는 최소한의 변경으로 온-프레미스에서 데이터베이스를 마이그레이션할 수 있도록 지원합니다.Managed instance supports database migration from on-premises with minimal to no database change. 이 옵션은 Azure SQL Database의 모든 PaaS 혜택을 제공하지만 이전에 SQL VM에서만 사용할 수 있었던 기능을 추가합니다.This option provides all of the PaaS benefits of Azure SQL Database but adds capabilities that were previously only available in SQL VMs. 여기에는 기본 가상 네트워크(VNet) 및 온-프레미스 SQL Server와의 거의 100% 호환성이 포함됩니다.This includes a native virtual network (VNet) and near 100% compatibility with on-premises SQL Server. Azure Virtual Machines의 SQL Server 는 업계 범주에 속하는 IaaS(Infrastructure as a service) 산업 부분으로 분류되며 Azure 클라우드의 완전 관리형 가상 머신 내에서 SQL Server를 실행할 수 있도록 지원합니다.SQL Server on Azure Virtual Machines falls into the industry category Infrastructure-as-a-Service (IaaS) and allows you to run SQL Server inside a fully-managed virtual machine in the Azure cloud. SQL Server 가상 머신은 Microsoft에서 소유, 호스팅 및 유지 관리하는 표준화된 하드웨어에서도 실행됩니다.SQL Server virtual machines also run on standardized hardware that is owned, hosted, and maintained by Microsoft. VM에서 SQL Server를 사용하는 경우 SQL Server 이미지에 이미 포함된 SQL Server 라이선스에 종량제를 사용하거나 기존 라이선스를 쉽게 사용할 수 있습니다.When using SQL Server on a VM, you can either pay-as you-go for a SQL Server license already included in a SQL Server image or easily use an existing license. VM을 필요에 따라 중지하거나 재개할 수도 있습니다. Azure에서 실행 중인 Windows Server 또는 Linux VM(Virtual Machines)의 클라우드에 설치되고 호스트된 SQL Server로, IaaS(infrastructure as a service)라고도 합니다.You can also stop or resume the VM as needed.SQL Server installed and hosted in the cloud on Windows Server or Linux virtual machines (VMs) running on Azure, also known as an infrastructure as a service (IaaS). Azure Virtual Machines의 SQL Server는 데이터베이스 변경 없이 온-프레미스 SQL Server 데이터베이스 및 애플리케이션을 마이그레이션하는 좋은 옵션입니다.SQL Server on Azure virtual machines is a good option for migrating on-premises SQL Server databases and applications without any database change. 모든 최신 버전의 SQL Server를 IaaS 가상 머신에 설치할 수 있습니다.All recent versions and editions of SQL Server are available for installation in an IaaS virtual machine. SQL Database와의 가장 중요한 차이점은 SQL Server VM에서는 데이터베이스 엔진을 완전히 제어할 수 있다는 것입니다.The most significant difference from SQL Database is that SQL Server VMs allow full control over the database engine. 유지 관리/패치가 시작되는 시기를 선택하고, 더 적은 로그로 더 빠르게 로드되도록 복구 모델을 단순 또는 대량 로그로 변경하고, 필요한 경우, 엔진을 일시 중지 또는 시작하고, SQL Server 데이터베이스 엔진을 완전히 사용자 지정할 수 있습니다.You can choose when maintenance/patching will start, to change the recovery model to simple or bulk logged to enable faster load less log, to pause or start engine when needed, and you can fully customize the SQL Server database engine. 이러한 추가 제어 기능과 더불어 가상 머신을 관리해야 하는 책임도 추가됩니다.With this additional control comes with added responsibility to manage the virtual machines. SQL Server 엔진을 완전히 제어할 수 있습니다.You have full control over the SQL Server engine. 최대 99.95%의 가용성이 보장됩니다.Up to 99.95% availability. 일치하는 온-프레미스 SQL Server의 버전과 완전히 동등합니다.Full parity with the matching version of on-premises SQL Server. 고정된 잘 알려진 데이터베이스 엔진 버전입니다.Fixed, well-known database engine version. SQL Server 온-프레미스에서 쉽게 마이그레이션할 수 있습니다.Easy migration from SQL Server on-premises. Azure VNet 내의 개인 IP 주소Private IP address within Azure VNet. SQL Server가 있는 호스트에 애플리케이션 또는 서비스를 배포할 수 있습니다.You have ability to deploy application or services on the host where SQL Server is placed. 온-프레미스의 SQL Server와의 높은 호환성High compatibility with SQL Server on-premises. 99.99% 가용성 보장99.99% availability guaranteed. 기본 제공 백업, 패치, 복구Built-in backups, patching, recovery. 안정적인 최신 데이터베이스 엔진 버전Latest stable Database Engine version. SQL Server에서 쉽게 마이그레이션할 수 있습니다.Easy migration from SQL Server. 기본 제공 고급 인텔리전스 및 보안Built-in advanced intelligence and security. 온라인에서 리소스(CPU/스토리지)를 변경할 수 있습니다.Online change of resources (CPU/storage). 가장 자주 사용되는 SQL Server 기능을 사용할 수 있습니다.The most commonly used SQL Server features are available. 필요한 리소스(CPU/스토리지)를 개별 데이터베이스에 할당할 수 있습니다.Ability to assign necessary resources (CPU/storage) to individual databases. 온라인에서 리소스(CPU/스토리지)를 변경할 수 있습니다.Online change of resources (CPU/storage). 사용자가 백업 및 패치를 관리해야 합니다.You need to manage your backups and patches. 사용자 고유의 고가용성 솔루션을 구현해야 합니다.You need to implement your own High-Availability solution. 리소스(CPU/스토리지)를 변경하는 동안 가동 중지 시간이 발생합니다.There is a downtime while changing the resources(CPU/storage) 사용할 수 없는 최소한의 SQL Server 기능이 아직 있습니다.There is still some minimal number of SQL Server features that are not available. 정확한 유지 관리 시간이 보장되지 않습니다(하지만 거의 투명함).No guaranteed exact maintenance time (but nearly transparent). SQL Server 버전과의 호환성은 데이터베이스 호환성 수준을 사용해야만 달성될 수 있습니다.Compatibility with the SQL Server version can be achieved only using database compatibility levels. SQL Server에서 마이그레이션하기 어려울 수 있습니다.Migration from SQL Server might be hard. 일부 SQL Server 기능을 사용할 수 없습니다.Some SQL Server features are not available. SQL Server 버전과의 호환성은 데이터베이스 호환성 수준을 사용해야만 달성될 수 있습니다.Compatibility with the SQL Server version can be achieved only using database compatibility levels. 개인 IP 주소를 할당할 수 없습니다(방화벽 규칙을 사용하여 액세스를 제한할 수 있음).Private IP address cannot be assigned (you can limit the access using firewall rules). 각 배포 옵션이 Microsoft 데이터 플랫폼에 얼마나 적합한지 알아보고 비즈니스 요구 사항에 적합한 옵션을 찾는 데 도움이 됩니다.Learn how each deployment option fits into the Microsoft data platform and get help matching the right option to your business requirements. 비용 절감이 우선이든 관리 최소화가 무엇보다 중요하든 이 문서에서는 가장 관심 있는 비즈니스 요구 사항에 대해 어떤 접근 방식이 결과를 가져오는지 결정하도록 도울 수 있습니다.Whether you prioritize cost savings or minimal administration ahead of everything else, this article can help you decide which approach delivers against the business requirements you care about most. Azure와 온-프레미스 SQL Server 데이터베이스를 비교 논의할 때 우선 이 둘을 모두 사용할 수 있다는 점을 이해해야 합니다.One of the first things to understand in any discussion of Azure versus on-premises SQL Server databases is that you can use it all. Microsoft의 데이터 플랫폼에서는 SQL Server 기술을 활용하며 물리적 온-프레미스 컴퓨터, 사설 클라우드 환경, 타사 호스팅 사설 클라우드 환경 및 공용 클라우드 전반에서 이 기술을 사용할 수 있습니다.Microsoft’s data platform leverages SQL Server technology and makes it available across physical on-premises machines, private cloud environments, third-party hosted private cloud environments, and public cloud. Azure 가상 머신에서 SQL Server를 사용하면 온-프레미스 배포와 클라우드에 호스트된 배포를 조합하여 고유하고 다양한 비즈니스 요구 사항을 충족하고, 이러한 환경 전반에서 일련의 서버 제품, 개발 도구 및 전문 지식을 동일하게 사용할 수 있습니다.SQL Server on Azure virtual machines enables you to meet unique and diverse business needs through a combination of on-premises and cloud-hosted deployments, while using the same set of server products, development tools, and expertise across these environments. 다이어그램에 나온 대로 각 제품의 특징을 인프라에 대한 관리 수준(X축)과 데이터베이스 수준 통합 및 자동화를 통해 얻는 비용 효율성의 정도(Y축)를 기준으로 설명할 수 있습니다.As seen in the diagram, each offering can be characterized by the level of administration you have over the infrastructure (on the X axis), and by the degree of cost efficiency achieved by database level consolidation and automation (on the Y axis). 다음 섹션에서는 Microsoft 공용 클라우드의 SQL Server인 Azure VM의 SQL Server 및 Azure SQL Database에 대해 알아봅니다.In the following sections, you learn about SQL Server in the Microsoft public cloud: Azure SQL Database and SQL Server on Azure VMs. 또한 애플리케이션에 가장 적합한 옵션을 결정하는 데 영향을 미치는 일반적인 비즈니스 동인도 살펴봅니다.In addition, you explore common business motivators for determining which option works best for your application. 여러 데이터베이스를 프로비전 및 관리하는 전체 관리 비용을 최소한으로 줄이는 데 최적화되어 있습니다.Optimized to reduce overall management costs to the minimum for provisioning and managing many databases. 가상 머신, 운영 체제 또는 데이터베이스 소프트웨어를 관리할 필요가 없으므로 지속적인 관리 비용을 줄입니다.It reduces ongoing administration costs because you do not have to manage any virtual machines, operating system or database software. 업그레이드, 고가용성 또는 백업을 관리할 필요가 없습니다.You do not have to manage upgrades, high availability, or backups. 일반적으로 Azure SQL Database는 단일 IT 또는 개발 리소스로 관리되는 데이터베이스 수를 크게 늘립니다.In general, Azure SQL Database can dramatically increase the number of databases managed by a single IT or development resource. 또한 탄력적 풀은 테넌트 격리, 데이터베이스 간에 리소스를 공유하여 비용을 줄이는 기능을 비롯한 기능으로 SaaS 다중 테넌트 애플리케이션 아키텍처를 지원합니다.Elastic pools also support SaaS multi-tenant application architectures with features including tenant isolation and the ability to scale to reduce costs by sharing resources across databases. 관리되는 인스턴스는 데이터베이스 간에 리소스를 공유하는 기능뿐만 아니라 기존 애플리케이션을 쉽게 마이그레이션할 수 있게 해주는 인스턴스 범위 기능을 지원합니다.Managed instance provides support for instance-scoped features enabling easy migration of existing applications, as well as sharing resources amongst databases. 기존 애플리케이션을 Azure로 마이그레이션하거나 기존 온-프레미스 애플리케이션을 하이브리드 배포의 클라우드로 확장하는 데 최적화됩니다.Optimized for migrating existing applications to Azure or extending existing on-premises applications to the cloud in hybrid deployments. 또한 가상 머신에서 SQL Server를 사용하여 기존 SQL Server 애플리케이션을 개발하고 테스트할 수 있습니다.In addition, you can use SQL Server in a virtual machine to develop and test traditional SQL Server applications. Azure VM의 SQL Server를 사용할 경우 전용 SQL Server 인스턴스와 클라우드 기반 VM에 대한 모든 관리 권한을 갖습니다.With SQL Server on Azure VMs, you have the full administrative rights over a dedicated SQL Server instance and a cloud-based VM. 이 옵션은 가상 머신을 유지 관리하는 IT 리소스를 이미 갖춘 조직에게 가장 적합합니다.It is a perfect choice when an organization already has IT resources available to maintain the virtual machines. 이러한 기능을 사용하면 애플리케이션 관련 성능 및 가용성 요구 사항을 해결하는 고도로 사용자 지정된 시스템을 구축할 수 있습니다.These capabilities allow you to build a highly customized system to address your application’s specific performance and availability requirements. 적합한 환경:Best for: 개발 및 마케팅에서 시간 제약 조건이 있고 안정적인 최신 SQL Server 기능을 사용하려는, 클라우드용으로 설계된 새 애플리케이션New cloud-designed applications that want to use the latest stable SQL Server features and have time constraints in development and marketing. 최소한의 변경으로 클라우드로 마이그레이션되며 안정적인 최신 SQL Server 기능을 사용하려는 새 애플리케이션 또는 기존 온-프레미스 애플리케이션New applications or existing on-premises applications that want to use the latest stable SQL Server features and that are migrated to the cloud with minimal changes. 변경 없이 또는 최소한의 변경으로 클라우드로 빠르게 마이그레이션해야 하는 기존 애플리케이션Existing applications that require fast migration to the cloud with minimal changes or no changes. 온-프레미스 개발 및 테스팅 SQL Server 하드웨어를 구입하지 않는 빠른 개발 및 테스트 시나리오Rapid development and test scenarios when you do not want to buy on-premises non-production SQL Server hardware. 데이터베이스에 대한 기본 제공 고가용성, 재해 복구 및 업그레이드가 필요한 팀Teams that need built-in high availability, disaster recovery, and upgrade for the database. SQL Database 단일 데이터베이스 및 풀링된 데이터베이스와 동일합니다.Same as SQL Database single and pooled databases. SQL Server에 대한 고가용성, 재해 복구 및 패치를 구성, 미세 조정, 사용자 지정 및 관리할 수 있는 팀Teams that can configure, fine tune, customize, and manage high availability, disaster recovery, and patching for SQL Server. 자동화된 기능을 제공하는 일부 팀은 이를 크게 간소화합니다.Some provided automated features dramatically simplify this. 기본 운영 체제 및 구성 설정을 관리하지 않으려는 팀입니다.Teams that do not want to manage the underlying operating system and configuration settings. SQL Database 단일 데이터베이스 및 풀링된 데이터베이스와 동일합니다.Same as SQL Database single and pooled databases. 모든 관리 권한이 있는 사용자 지정 환경이 필요합니다.You need a customized environment with full administrative rights. 최대 100TB의 데이터베이스.Databases of up to 100 TB. 최대 8TB.Up to 8 TB. 저장소의 최대 64TB를 사용하는 SQL Server 인스턴스SQL Server instances with up to 64 TB of storage. 인스턴스는 필요한 만큼 많은 데이터베이스를 지원할 수 있습니다.The instance can support as many databases as needed. 호환성Compatibility 대부분의 온-프레미스 데이터베이스 수준 기능을 지원합니다.Supports most on-premises database-level capabilities. 거의 모든 온-프레미스 인스턴스 수준 및 데이터베이스 수준 기능을 지원합니다.Supports almost all on-premises instance-level and database-level capabilities. 모든 온-프레미스 기능을 지원합니다.Supports all on-premises capabilities. 리소스:Resources: 기본 인프라를 구성하고 관리하는 데 IT 리소스를 사용하지 않지만 애플리케이션 계층에 중점을 두려고 합니다.You do not want to employ IT resources for configuration and management of the underlying infrastructure but want to focus on the application layer. SQL Database 단일 데이터베이스 및 풀링된 데이터베이스와 동일합니다.Same as SQL Database single and pooled databases. 구성 및 관리를 위한 일부 IT 리소스가 있습니다.You have some IT resources for configuration and management. 자동화된 기능을 제공하는 일부 팀은 이를 크게 간소화합니다.Some provided automated features dramatically simplify this. 총 소유 비용:Total cost of ownership: 하드웨어 비용을 제거하고 관리 비용을 절감합니다.Eliminates hardware costs and reduces administrative costs. SQL Database 단일 데이터베이스 및 풀링된 데이터베이스와 동일합니다.Same as SQL Database single and pooled databases. 하드웨어 비용을 제거합니다.Eliminates hardware costs. 비즈니스 연속성:Business continuity: Azure SQL Database는 기본 제공된 내결함성 인프라 기능 외에도 자동화된 백업, 특정 시점 복원, 지리적 복원, 활성 지역 복제 및 자동 장애 조치(failover) 그룹 등의 기능을 제공하여 비즈니스 연속성을 향상시킵니다.In addition to built-in fault tolerance infrastructure capabilities, Azure SQL Database provides features, such as automated backups, Point-In-Time Restore, geo-restore, Active geo-replication, and Auto-failover groups to increase business continuity. 자세한 내용은 SQL Database 비즈니스 연속성 개요를 참조하세요.For more information, see SQL Database business continuity overview. SQL Database 단일 데이터베이스 및 풀링된 데이터베이스와 동일하며, 사용자가 시작한 복사 전용 백업을 추가로 사용할 수 있습니다.Same as SQL Database single and pooled databases, plus user-initiated, copy-only backups are available. Azure VM의 SQL Server를 사용하면 데이터베이스의 특정 요구에 맞게 고가용성 및 재해 복구 솔루션을 설정할 수 있습니다.SQL Server on Azure VMs lets you set up a high availability and disaster recovery solution for your database’s specific needs. 따라서 시스템을 애플리케이션에 최적화할 수 있습니다.Therefore, you can have a system that is highly optimized for your application. 필요한 경우 장애 조치(Failover)를 직접 테스트하고 실행할 수 있습니다.You can test and run failovers by yourself when needed. 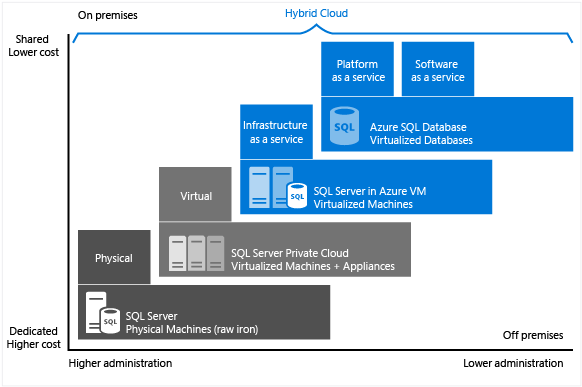 자세한 내용은 Azure Virtual Machines의 SQL Server에 대한 고가용성 및 재해 복구를 참조하세요.For more information, see High Availability and Disaster Recovery for SQL Server on Azure Virtual Machines. 하이브리드 클라우드:Hybrid cloud: 온-프레미스 애플리케이션은 Azure SQL Database의 데이터에 액세스할 수 있습니다.Your on-premises application can access data in Azure SQL Database. Azure ExpressRoute 또는 VPN Gateway를 사용하여 기본 가상 네트워크 구현 및 온-프레미스 환경에 연결Native virtual network implementation and connectivity to your on-premises environment using Azure Express Route or VPN Gateway. Azure VM의 SQL Server를 사용하면 애플리케이션을 일부는 클라우드에서, 일부는 온-프레미스에서 실행할 수 있습니다.With SQL Server on Azure VMs, you can have applications that run partly in the cloud and partly on-premises. 예를 들어 Azure Virtual Network를 통해 클라우드로 온-프레미스 네트워크 및 Active Directory 도메인을 확장할 수 있습니다.For example, you can extend your on-premises network and Active Directory Domain to the cloud via Azure Virtual Network. 하이브리드 클라우드 솔루션에 대한 자세한 내용은 클라우드로 온-프레미스 데이터 솔루션 확장을 참조하세요.For more information on hybrid cloud solutions, see Extending on-premises data solutions to the cloud. 비용 - PaaS 및 IaaS 옵션 둘 다 기본 인프라 및 라이선스를 고려하는 기본 가격을 포함합니다.Cost - Both PaaS and IaaS option include base price that cover underlying infrastructure and licensing. 그러나 IaaS 옵션을 사용할 경우 데이터베이스를 관리하기 위한 시간과 리소스를 추가로 투자해야 하지만 PaaS에서는 이러한 관리 기능이 가격에 포함되어 있습니다.However, with IaaS option you need to invest additional time and resources to manage your database, while in PaaS you are getting these administration features included in the price. IaaS 옵션을 사용하면 사용하지 않을 때 리소스를 종료하여 비용을 절감할 수 있지만, PaaS 버전은 필요하지 않을 때 리소스를 삭제했다가 다시 만들지 않으면 항상 실행됩니다.IaaS option enables you to shut-down your resources while you are not using them to decrease the cost, while PaaS version is always running unless if you drop and re-create your resources when they are needed. 관리 - PaaS 옵션은 데이터베이스를 관리하는 데 투자해야 하는 시간을 줄여줍니다.Administration - PaaS options reduce the amount of time that you need to invest to administer the database. 그러나 사용자 지정 관리 작업을 수행 하거나 실행할 수 있는 스크립트 범위도 제한 합니다.However, it also limits the range of custom administration tasks and scripts that you can perform or run. 예를 들어 CLR 단일 또는 풀링된 데이터베이스는 지원 되지 않습니다 하지만 관리 되는 인스턴스에서 지원 됩니다.For example, the CLR is not supported with single or pooled databases, but is supported for a managed instance. 또한 paas에서 배포 옵션이 추적 플래그의 사용을 지원 합니다.Also, no deployment options in PaaS support the use of trace flags. 서비스 수준 계약 - IaaS 및 PaaS 둘 다 높은 업계 표준 SLA를 제공합니다.Service-Level Agreement - Both IaaS and PaaS provide high, industry standard SLA. PaaS 옵션은 99.99%의 SLA를 보장하지만, IaaS는 인프라에 대해 99.95%의 SLA를 보장합니다. 따라서 데이터베이스의 가용성을 보장하려면 추가 메커니즘을 구현해야 합니다.PaaS option guarantees 99.99% SLA, while IaaS guarantees 99.95% SLA for infrastructure, meaning that you need to implement additional mechanisms to ensure availability of your databases. 극단적인 경우, PaaS와 일치하는 고가용성 솔루션을 구현하려는 경우 VM에서 추가 SQL Server를 만들고 AlwaysOn 가용성 그룹을 구성해야 할 수 있습니다. 이 경우 데이터베이스의 비용이 2배가 들 수 있습니다.In the extreme case, if you want to implement High-availability solution that is matching PaaS, you might need to create additional SQL Server in VM and configure AlwaysOn Availability groups, which might double the cost of your database. Azure로 전환해야 할 때 -Azure VM의 SQL Server는 작업 환경에 정확히 일치하므로 온-프레미스에서 Azure SQL VM으로 마이그레이션하는 것은 데이터베이스를 한 온-프레미스 서버에서 다른 온-프레미스 서버로 이동하는 것과는 다릅니다.Time to move to Azure - SQL Server in Azure VM is the exact match of your environment, so migration from on-premises to Azure SQL VM is not different than moving the databases from one on-premises server to another. 또한 관리되는 인스턴스를 사용하면 매우 쉽게 마이그레이션할 수 있지만, 관리되는 인스턴스로 마이그레이션하기 전에 몇 가지 변경 내용을 적용해야 할 수 있습니다.Managed instance also enables extremely easy migration; however, there might be some changes that you need to apply before you migrate to a managed instance. 이러한 요소는 다음 섹션에서 자세히 설명합니다.These factors will be discussed in more details in the following sections. 현금이 쪼들리는 신생 기업이든 자리를 잡은 회사에서 빠듯한 예산으로 운영되는 팀이든 데이터베이스를 호스트하는 방법을 결정할 때 제한된 자금이 주된 동인으로 작용하는 경우가 많습니다.Whether you’re a startup that is strapped for cash, or a team in an established company that operates under tight budget constraints, limited funding is often the primary driver when deciding how to host your databases. 이 섹션에서는 SQL Database 및 Azure VM의 SQL Server 등 두 가지 관계형 데이터베이스 옵션에 대한 Azure의 청구 및 라이선스 기본 사항을 알아봅니다.In this section, you learn about the billing and licensing basics in Azure with regards to these two relational database options: SQL Database and SQL Server on Azure VMs. 또한 총 애플리케이션 비용을 계산하는 방법에 대해 알아봅니다.You also learn about calculating the total application cost. 현재 SQL Database는 서비스로 판매되며 각기 다른 리소스 요금이 책정된 여러 배포 옵션과 여러 서비스 계층에서 사용할 수 있습니다. 모든 옵션은 고객이 선택하는 서비스 계층과 컴퓨팅 크기를 기준으로 시간당 고정 요금이 청구됩니다.Currently, SQL Database is sold as a service and is available with several deployment options and in several service tiers with different prices for resources, all of which are billed hourly at a fixed rate based on the service tier and compute size you choose. 현재 지원되는 서비스 계층, 컴퓨팅 크기 및 스토리지 용량에 대한 최신 정보는 DTU 기반 구매 모델 및 vCore 기반 구매 모델을 참조하세요.For the latest information on the current supported service tiers, compute sizes, and storage amounts, see DTU-based purchasing model and vCore-based purchasing model. SQL Database 단일 데이터베이스를 사용하면 월 5$의 기본 계층부터 시작하는 다양한 가격 중에서 요구 사항에 적합한 서비스 계층을 선택할 수 있습니다.With SQL Database single database, you can choose a service tier that fits your needs from a wide range of prices starting from 5$/month for basic tier. 데이터베이스 인스턴스 간에 리소스를 공유하도록 탄력적 풀을 만들어서 비용을 줄이고 사용량 급증에 대비할 수 있습니다.You can create elastic pools to share resources among database instances to reduce costs and accommodate usage spikes. SQL Database 관리되는 인스턴스를 선택하면 고객이 보유한 라이선스를 사용할 수도 있습니다.With SQL Database managed instance, you can also bring your own license. BYOL(사용자 라이선스 필요)에 대한 자세한 내용은 Azure에서 Software Assurance를 통한 라이선스 이동을 참조하거나 Azure 하이브리드 혜택 계산기를 사용하여 최대 40%를 절감하는 방법을 알아보세요.For more information on bring-your-own licensing, see License Mobility through Software Assurance on Azure or use Azure Hybrid Benefit calculator to see how to save up to 40%. 또한 일반 데이터 전송 요금으로 발신 인터넷 트래픽에 대해 요금이 청구됩니다.In addition, you are billed for outgoing Internet traffic at regular data transfer rates. 애플리케이션의 다양한 처리량 요구에 맞게 서비스 계층과 계산 크기를 동적으로 조정할 수 있습니다.You can dynamically adjust service tiers and compute sizes to match your application’s varied throughput needs. SQL Database에서 데이터베이스 소프트웨어는 Microsoft에서 구성, 패치 적용 및 업그레이드를 수행하며 이는 관리 비용을 줄입니다.With SQL Database, the database software is automatically configured, patched, and upgraded by Microsoft, which reduces your administration costs. 또한 기본 제공 백업 기능을 사용하여 비용을 크게 절감할 수 있으며, 특히 데이터베이스 수가 많을 경우 그 효과가 큽니다.In addition, its built-in backup capabilities help you achieve significant cost savings, especially when you have a large number of databases. Azure VM의 SQL Server로 플랫폼에서 제공하는 SQL Server 이미지(라이선스 포함)를 사용하거나 사용자의 SQL Server 라이선스를 가져올 수 있습니다.With SQL Server on Azure VMs, you can use any of the platform-provided SQL Server images (which includes a license) or bring your SQL Server license. 지원되는 모든 SQL Server 버전(2008R2, 2012, 2014, 2016) 및 버전(Developer, Express, Web, Standard, Enterprise)을 사용할 수 있습니다.All the supported SQL Server versions (2008R2, 2012, 2014, 2016) and editions (Developer, Express, Web, Standard, Enterprise) are available. 또한 이미지의 BYOL(사용자 라이선스 필요)를 사용할 수 있습니다.In addition, Bring-Your-Own-License versions (BYOL) of the images are available. Azure에서 제공하는 이미지를 사용할 경우 VM 크기 및 선택하는 SQL Server 버전에 따라 운영 비용이 달라집니다.When using the Azure provided images, the operational cost depends on the VM size and the edition of SQL Server you choose. VM 크기 또는 SQL Server 버전과 관계없이 VM 디스크에 대한 Azure Storage 비용과 함께 SQL Server와 Windows 또는 Linux Server의 분당 라이선스 비용을 지불합니다.Regardless of VM size or SQL Server edition, you pay per-minute licensing cost of SQL Server and the Windows or Linux Server, along with the Azure Storage cost for the VM disks. 분당 청구 옵션을 사용하면 추가 SQL Server 라이선스를 구입하지 않고 필요한 시간 동안만 SQL Server를 사용할 수 있습니다.The per-minute billing option allows you to use SQL Server for as long as you need without buying addition SQL Server licenses. SQL Server 사용자 라이선스를 Azure로 가져오는 경우, 서버 및 저장소 비용만 청구됩니다.If you bring your own SQL Server license to Azure, you are charged for server and storage costs only. 고유한 라이선스 가져오기에 대한 자세한 내용은 Azure에서 Software Assurance를 통한 라이선스 이동을 참조하세요.For more information on bring-your-own licensing, see License Mobility through Software Assurance on Azure. 또한 일반 데이터 전송 요금으로 발신 인터넷 트래픽에 대해 요금이 청구됩니다.In addition, you are billed for outgoing Internet traffic at regular data transfer rates. 클라우드 플랫폼을 사용하기 시작하면 애플리케이션을 실행하는 비용에는 새 개발 및 진행 중인 관리 비용과 공용 클라우드 플랫폼 서비스 비용이 포함됩니다.When you start using a cloud platform, the cost of running your application includes the cost for new development and ongoing administration costs, plus the public cloud platform service costs. 많은 비즈니스의 경우 클라우드 서비스로 전환하는 결정은 드는 비용 만큼 관리의 복잡성을 오프로드하는 것과 관련됩니다.For many businesses, the decision to transition to a cloud service is as much about offloading complexity of administration as it is cost. IaaS 및 PaaS에서는 Microsoft가 기본 인프라를 관리하고, 모든 데이터를 자동으로 복제하여 재해 복구를 제공하고, 데이터베이스 소프트웨어를 구성 및 업그레이드하고, 부하 분산을 관리하고, 데이터 센터 내에서 서버 오류가 발생하는 경우 장애 조치(Failover)를 투명하게 수행합니다.With IaaS and PaaS, Microsoft administers the underlying infrastructure and automatically replicates all data to provide disaster recovery, configures and upgrades the database software, manages load balancing, and does transparent failover if there is a server failure within a data center. Azure SQL Database에서는 데이터베이스를 계속 관리할 수 있지만 데이터베이스 엔진, 운영 체제 또는 하드웨어를 더 이상 관리할 필요가 없습니다.With Azure SQL Database, you can continue to administer your database, but you no longer need to manage the database engine, the operating system, or the hardware. 계속 관리할 수 있는 항목의 예는 데이터베이스 및 로그인, 인덱스 및 쿼리 튜닝 및 감사 및 보안을 들 수 있습니다.Examples of items you can continue to administer include databases and logins, index and query tuning, and auditing and security. 또한 다른 데이터 센터에 고가용성을 구성하는 데 필요한 구성 및 관리가 최소화됩니다.Additionally, configuring high availability to another data center requires minimal configuration and administration. Azure VM에 대한 SQL Server에서는 운영 체제와 SQL Server 인스턴스 구성을 완벽히 제어할 수 있습니다.With SQL Server on Azure VMs, you have full control over the operating system and SQL Server instance configuration. VM에서는 운영 체제 및 데이터베이스 소프트웨어를 업데이트/업그레이드할 시기 및 바이러스 백신 등의 추가 소프트웨어를 설치할 시기를 사용자가 결정합니다.With a VM, it’s up to you to decide when to update/upgrade the operating system and database software and when to install any additional software such as anti-virus. 자동화된 일부 기능이 제공되어 패치, 백업 및 고가용성을 크게 간소화합니다.Some automated features are provided to dramatically simplify patching, backup, and high availability. 또한 VM 크기, 디스크 수 및 해당 저장소 구성도 사용자가 제어할 수 있습니다.In addition, you can control the size of the VM, the number of disks, and their storage configurations. Azure를 사용하면 VM이 필요한 크기를 변경할 수 있습니다.Azure allows you to change the size of a VM as needed. 자세한 내용은 Azure용 Virtual Machine 및 클라우드 서비스 크기를 참조하세요.For information, see Virtual Machine and Cloud Service Sizes for Azure. IT 부서의 경우 SLA(서비스 수준 계약)의 작동 시간 의무를 충족하는 일이 가장 우선합니다.For many IT departments, meeting up-time obligations of a Service Level Agreement (SLA) is a top priority. 이 섹션에서는 각 데이터베이스 호스팅 옵션에 어떤 SLA를 적용하는지 살펴봅니다.In this section, we look at what SLA applies to each database hosting option. Microsoft는 SQL Database에 대해 99.99%의 가용성 SLA를 제공합니다.For SQL Database, Microsoft provides an availability SLA of 99.99%. 최신 정보는 서비스 수준 계약을 참조하세요.For the latest information, see Service Level Agreement. Azure VM에서 실행 중인 SQL Server의 경우 Microsoft는 Virtual Machine을 다루는 99.95%의 가용성 SLA를 제공합니다.For SQL Server running on Azure VMs, Microsoft provides an availability SLA of 99.95% that covers just the Virtual Machine. 이 SLA는 VM에서 실행 중인 프로세스(예: SQL Server)를 다루지 않으며 가용성 집합에 두 개 이상의 VM 인스턴스를 호스트해야 합니다.This SLA does not cover the processes (such as SQL Server) running on the VM and requires that you host at least two VM instances in an availability set. 최신 정보는 VM SLA를 참조하세요.For the latest information, see the VM SLA. VM 내에서 데이터베이스 고가용성(HA)을 이용하려면 SQL Server에서 지원되는 고가용성 옵션 중 하나(예: Always On 가용성 그룹)를 구성해야 합니다.For database high availability (HA) within VMs, you should configure one of the supported high availability options in SQL Server, such as Always On Availability Groups. 지원되는 고가용성 옵션을 사용하면 추가 SLA를 제공하지 않지만 >99.99%의 데이터베이스 가용성을 달성할 수 있습니다.Using a supported high availability option doesn't provide an additional SLA, but allows you to achieve >99.99% database availability. SQL Database 단일 데이터베이스 또는 탄력적 풀은 새 솔루션에 대한 개발자 생산성과 빠른 출시 시간이 중요한 경우, 클라우드용으로 설계된 애플리케이션에 적합한 솔루션입니다.SQL Database single databases or elastic pools are the right solution for cloud-designed applications when developer productivity and fast time-to-market for new solutions are critical. 프로그래밍 방식 DBA와 비슷한 기능을 사용하여 기본 운영 체제 및 데이터베이스를 관리할 필요성을 낮추므로 클라우드 설계자와 개발자에게 이상적인 솔루션입니다.With programmatic DBA-like functionality, it is perfect for cloud architects and developers as it lowers the need for managing the underlying operating system and database. SQL Database 관리되는 인스턴스는 기존 애플리케이션을 Azure SQL Database로 마이그레이션하는 과정을 간소화하므로 Azure에서 마이그레이션된 데이터베이스 애플리케이션을 빠르게 출시할 수 있습니다.SQL Database managed instance greatly simplifies the migration of existing applications to Azure SQL Database, enabling you to bring migrated database applications to market in Azure quickly. Azure VM에서 실행 중인 SQL Server는 기존 애플리케이션 또는 새 애플리케이션에 큰 데이터베이스가 필요하거나 SQL Server 또는 Windows/Linux의 모든 기능에 액세스해야 하며 새로운 온-프레미스 하드웨어를 획득하는 시간과 비용을 피하려는 경우에 유용합니다.SQL Server running on Azure VMs is perfect if your existing or new applications require large databases or access to all features in SQL Server or Windows/Linux, and you want to avoid the time and expense of acquiring new on-premises hardware. 또한 기존 온-프레미스 애플리케이션 및 데이터베이스를 Azure로 있는 그대로 마이그레이션하기를 원하지만 Azure SQL Database 관리되는 인스턴스가 적합하지 않은 경우에 적절한 선택입니다.It is also a good fit when you want to migrate existing on-premises applications and databases to Azure as-is - in cases where Azure SQL Database managed instance is not a good fit. 프레젠테이션, 애플리케이션 및 데이터 계층을 변경할 필요가 없으므로 기존 솔루션 재설계에 따른 비용과 예산이 절감됩니다.Since you do not need to change the presentation, application, and data layers, you save time and budget on re-architecting your existing solution. 대신 모든 솔루션을 Azure에 마이그레이션하고 Azure 플랫폼에 필요할 수 있는 일부 성능 최적화를 수행하는 데 집중할 수 있습니다.Instead, you can focus on migrating all your solutions to Azure and in doing some performance optimizations that may be required by the Azure platform. 자세한 내용은 Azure Virtual Machines의 SQL Server에 대한 성능 모범 사례를 참조하세요.For more information, see Performance Best Practices for SQL Server on Azure Virtual Machines. SQL Database를 시작하려면 첫 Azure SQL Database를 참조하세요.See Your first Azure SQL Database to get started with SQL Database. SQL Database 가격 책정을 참조하세요.See SQL Database pricing. Azure VM에서 SQL Server를 시작하려면 Azure에서 SQL Server 가상 머신 프로비전을 참조하세요.See Provision a SQL Server virtual machine in Azure to get started with SQL Server on Azure VMs.